Centre for Nano and Material Sciences (CNMS) is a research centre established by Jain University (formerly known as Sri Bhagawan Mahaveer Jain College, SBMJC), Bangalore. Jain University is declared deemed to be University under section 3 of the UGC act, 1956 by the Ministry of Human Resource Development of the Union Government vide notification No.F-9-57 / 2007-U.3 (A) GOI December 19, 2008 and July 24, 2009. CNMS has hosted a broad range of research investigations in the frontier areas of Chemistry operated by a group of highly skilled faculty members. Nano Science, Catalysis, Nano-structured Hybrid Functional Materials, Micro and Nano Fluidics, Bioinorganic, Clinical Chemistry, Electrochemistry, Analytical Chemistry, Drug Discovery, Heterogeneous Catalysis for Energy (H2 production), Medicinal and Organometallic Chemistry are the major areas of our research concerns. In each research field, CNMS nurtures young and innovative research fellows in their doctoral programs. . The faculty members are from the reputed Institutes and also attract substantial financial support for their research activities from governmental and private funding agencies. Centre is well equipped with modern laboratories with advanced facilities, efficient computer networks and library. Centre offers a vibrant atmosphere to students and faculty to nurture the spirit of scientific quest and to pursue cutting-edge research in a highly encouraging environment. Since the inception of CNMS in the year 2012, there has been a tremendous growth in terms of research output through publications and funding received from external agencies. 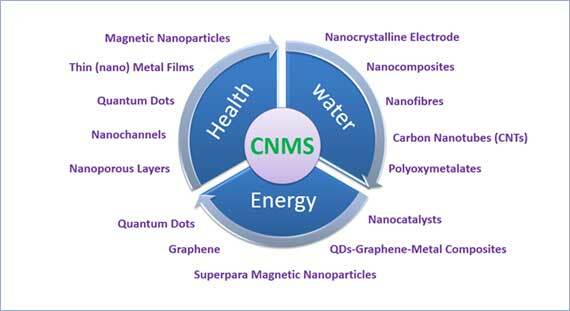 We at CNMS, offer PhD degree in Chemistry, Material Sciences and Nanotechnology domain covering some of the exciting cutting edge research area. Our past students are well placed within and outside India in various prestigious institutes at various levels. In house high end equipment and other existing infrastructures facilitates to carry out high quality research in the thrust areas like in water, energy and health.